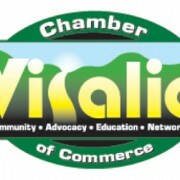 VISALIA - The Visalia Chamber of Commerce has announced that Karen Gross (State Farm Insurance), Nathan Halls (Suncrest Bank), Todd Mackey (Tropics by Design), Amy Pack (Amy Pack Strategic Marketing) and George Vasquez (Rabobank N.A.) are the newest members of the organization’s board of directors. The outgoing board members are Matt Graham (Hyde Commercial Real Estate), Samantha Rummage-Mathias (Holiday Inn Hotel and Conference Center), Anil Chagan (Infinite Hospitality), Bill Maze (H2O Systems), and Stephen Peck (Peck Planning & Development, LLC). Nathan Halls recently became president – Visalia, for Suncrest Bank. He is a life-long valley resident; members of Halls’ family have been running businesses here for four generations. Raised in Sanger, he is a graduate of California State University, Fresno and Pacific Coast Banking School in Seattle. Nathan, his wife and two children reside in Visalia and he is active in the United Way of Tulare County, Reaching Higher, The Young Entrepreneurs Academy, AYSO Soccer and Visalia Bible Study Fellowship. Karen Gross is a State Farm agent in Visalia. She has been with State Farm for over 16 years, starting as a licensed team member then working her way up to owning her own agency. Her passion in business is helping people protect their families and plan for the future. Aside from being a business owner, Karen is a wife, and mother of three small children. “I am honored to be selected as a board member and am looking forward to helping other small business owners expand their success,” Gross said. George Vasquez is a VP-branch manager at Rabobank. George is also an entrepreneur and co-owns Elite Dance Academy & The Staffing Connection. He is deeply involved in the community and participates in the Tulare County Economic Development Corporation, the Leadership Visalia Mentor Program, San Joaquin Valley College Advisory Board, the SBDC Advisory Board, the Breakfast Rotary and the Tulare Kings Hispanic Chamber of Commerce. He lives in Visalia with his wife and daughter and has two adult sons. Todd Mackey is the owner of TROPICS by Design which provides outdoor landscaping and interior-plantscaping services. He began working at the family business at the age of 7 when it was called “The Garden Nursery.” Mackey has a bachelor’s degree in Management and Organizations Development from Fresno Pacific University with a minor degree in Organization Communication. He has been very active in various Chamber Committees for many years and has served with the Society of Human Resources and on the board of the Visalia Nazarene Church. Amy Pack is no stranger to the Chamber. She served on the board of directors in the late 1990’s. She is currently an independent strategic marketing consultant for non-profits and businesses. She recently retired from the Gannett Company after 18 years as the Visalia and Tulare president/publisher. She has been active in the Visalia community as a founding board member of the Pro-Youth/HEART program and currently serves on the advisory board of the Sequoia Riverlands Trust, the Rotary Youth Exchange Program and on the cabinet of the National Acoustic Neuroma Association.